If you are familiar with Chinese cuisine, you’ll likely have encountered hoisin sauce at some point in a meal – it often appears as a glaze for meat, it makes for a mouthwatering dipping sauce, and sometimes it is added as an essential ingredient to stir fries. By all means it is sweet and salty, making it nearly irresistible, but here’s the catch: traditional hoisin sauce does not satisfy Paleo requirements. The base ingredients are soy beans and spices (fennel seeds, red chillies and garlic, along with vinegar and sugar), though prepared sauces are bound to use wheat or corn flour as a thickener. You have to be prudent and check the list of ingredients each and every time you buy a product – hoisin sauce is something to watch out for if you have gluten sensitivities. Let us introduce our Paleo hoisin sauce, and see if we can sway you to make your own. Start by mincing 2 cloves of garlic and 2 tablespoons of ginger, add 1/4 cup of coconut aminos, 2 tablespoons of white rice or apple cider vinegar and a small amount of honey; stir well. Next, you’ll add the homemade hoisin sauce to your cooked shrimp, mango and daikon radish mix and let is simmer for a few minutes. If you desire a thicker sauce consider adding a tablespoon or two of almond butter, and for a little spice, chili flakes are wonderfully nice. Serve over a bed of cauliflower rice with an exciting side of ginger bok choy. In a bowl combine the garlic, ginger, coconut aminos, vinegar and honey. Season the shrimp to taste and cook in the heated coconut oil, 2 to 3 minutes per side; set aside. Add the mango and daikon to the pan and cook until softened, 4 to 5 minutes. 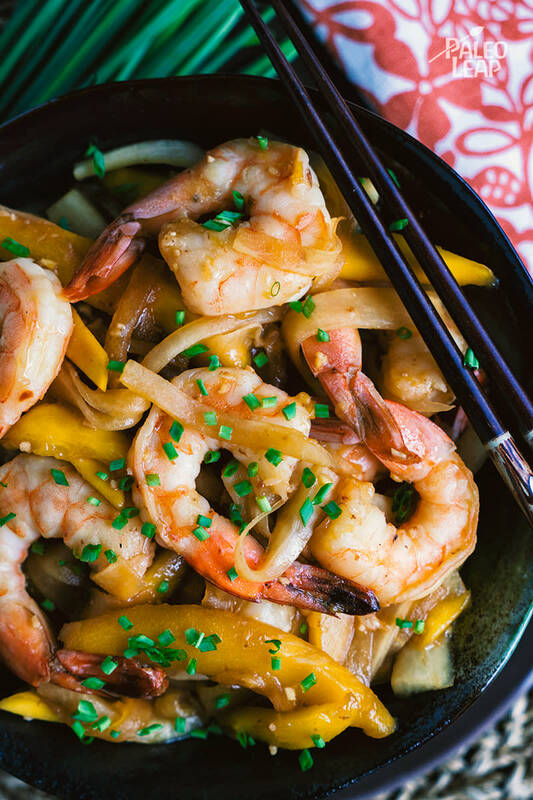 Bring the shrimp back to the skillet and pour in the sauce, gently toss everything. Cook until everything is warm through, another 4 to 5 minutes.